My perfect weekend includes a relaxed stroll through the market on Saturday morning (not too early though), a vast breakfast with bacon, eggs, and sandwiches, followed by some minor flat projects, such as rearranging a shelf in my kitchen. Not more than one shelf, it’s the weekend after all. The afternoon can be filled with a walk at one of Berlin’s lakes, or exploring an undiscovered neighbourhood and a hot chocolate at a cosy café. A visit to a couple exhibitions at some of my favourite museums in the city is also an option. There are always so many amazing art shows and at the moment, I’m far from keeping up. This week it’s Jackson Pollock at the KunstHalle showing his grand work Mural from 1943 and we managed to see it – it’s breathtaking! In the evening, we may have some friends over for dinner, or maybe it’s just the two of us enjoying a bottle of wine and an extensive meal. And if I’m lucky, we’ve got an invitation to a friend’s house. This week it was my aunt Ursula and my uncle Uwe, their cooking is divine, the wine as well, and the company is always the best. I love to cook, especially in the evening, to calm down and relax after a busy day, but once in a while it feels so good when someone else takes care of you and invites you to join their scrumptious culinary adventures. Sunday’s next: Sleeping in is given, breakfast is a little more luscious than the day before and can easily extend into the early afternoon. I can’t sit at the table and eat all day, I need a little activity even on a lazy Sunday, and some time on my own. So I bake, just me and my mixer, bowls, and sweets in the kitchen, some music from the vinyl player and I’m happy. I can’t start my baking projects too late as at 6, the preparation of our weekly Sunday-pizza ritual begins. In between, I also manage to squeeze in our obligatory tea time: A cup of English tea and some cookies. 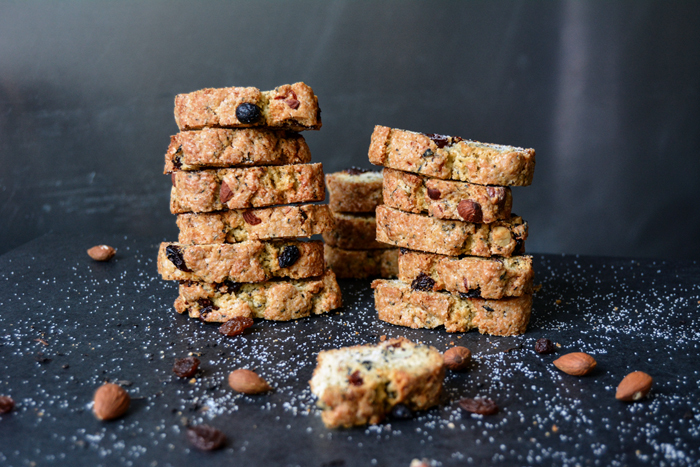 I made these Earl Grey biscotti with almonds and raisins a couple days ago and they taste so good that we enjoy them for breakfast, lunch, dessert, and tea time. The flowery aroma of the fragile tea leaves is present, I didn’t aim for a subtle hint that makes you guess what this distinct taste might be. It’s Earl Grey, presenting itself with confidence. 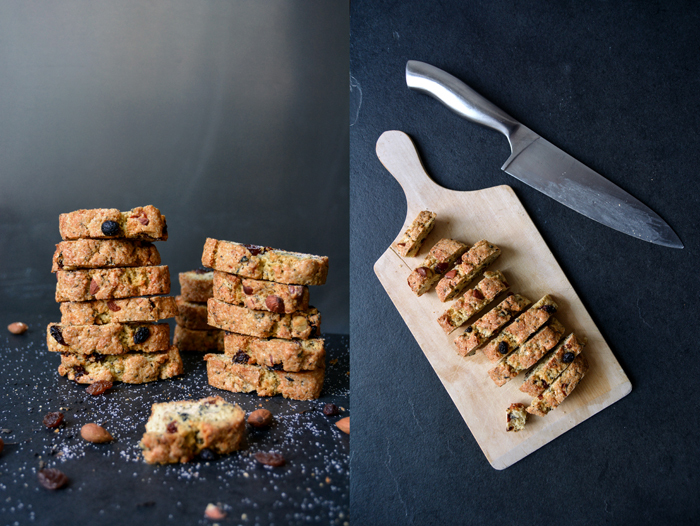 I balance it out with the sweetness of the raisins, fruity orange zest, and the nutty almonds. 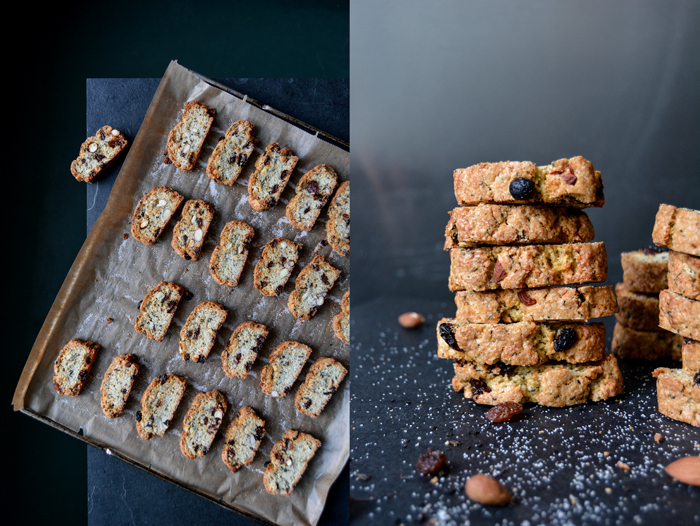 They are nice and crunchy, perfect to dip into your tea or dark espresso, if that’s your kind of thing. Whisk the tea leaves into the warm, melted butter and let it cool for a few minutes. Combine the flour, baking powder, sugar, orange zest, and salt. In a large bowl, using an electric mixer, beat the eggs until creamy, stir in the Earl Grey-butter mixture and mix until combined. Add the flour mixture and mix with the dough hooks of an electric mixer until just combined. Stir in the raisins and almonds, form a ball and divide it into 4 parts. Form each part into a long loaf shape (around 5cm / 2″ wide) and place them on the lined baking sheet. Bake for 25-28 minutes (slightly longer if using a conventional oven) or until golden. Take the loaves out of the oven and let them cool for 20 minutes. Line a second baking sheet with parchment paper. 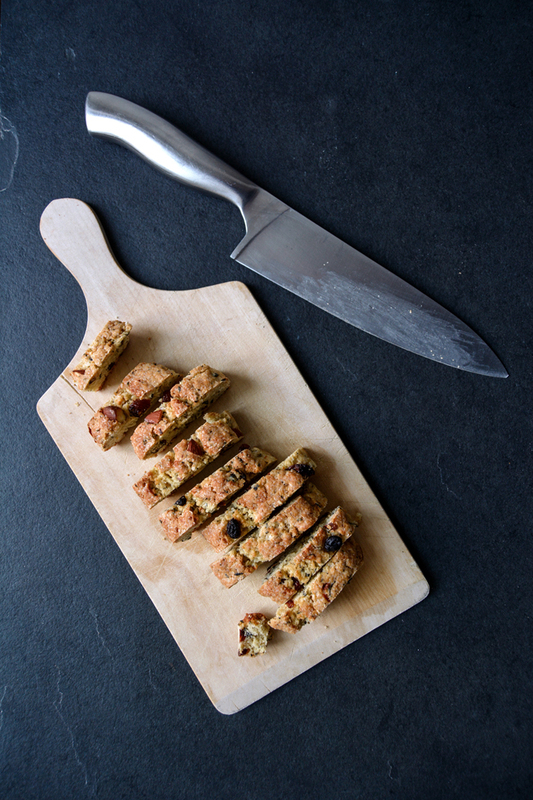 Carefully cut each loaf into 1 1/2cm / 1/2″ slices and transfer the biscotti to the lined baking sheets, sprinkle each one with a little sugar. 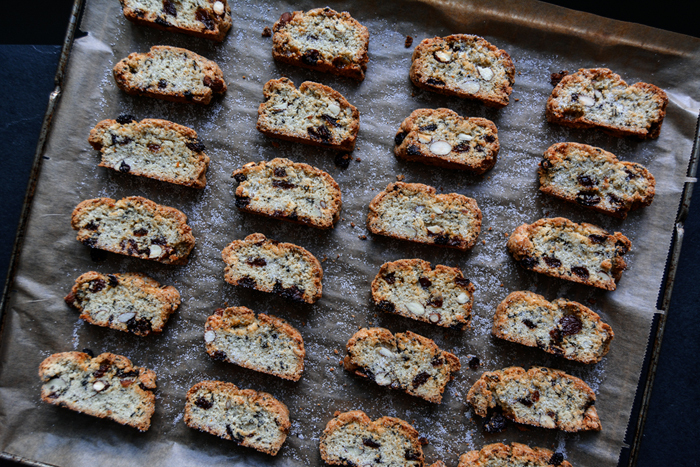 Bake for 6 minutes, turn the biscotti over and sprinkle the other side with sugar. Bake for another 6 minutes or until golden brown. 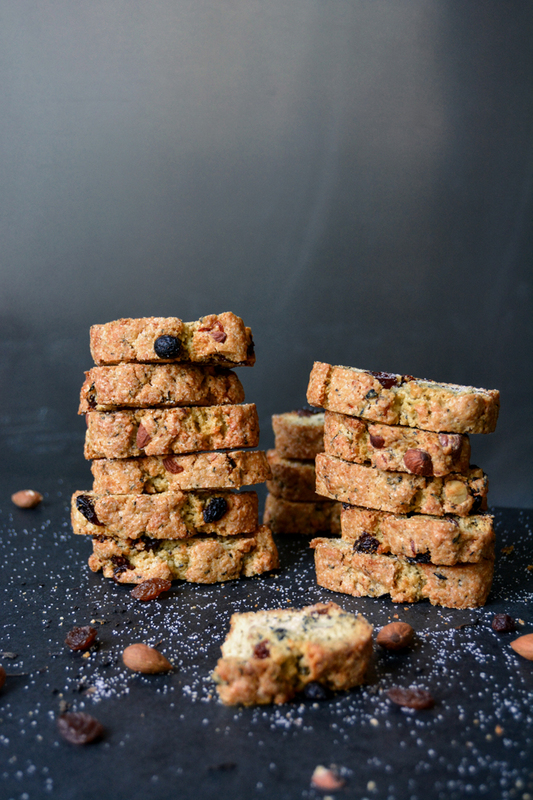 Transfer the biscotti to a wire rack and let them cool. 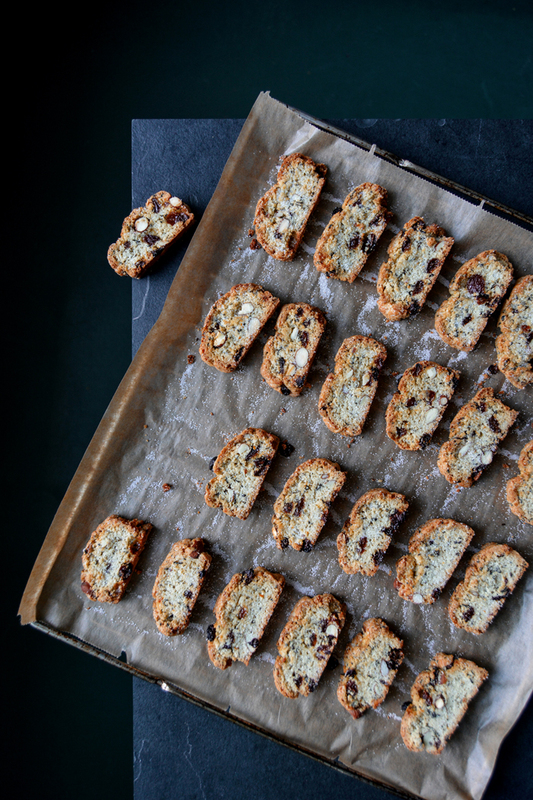 Once completely cool, you can keep the biscotti in an airtight container for up to 10 days. 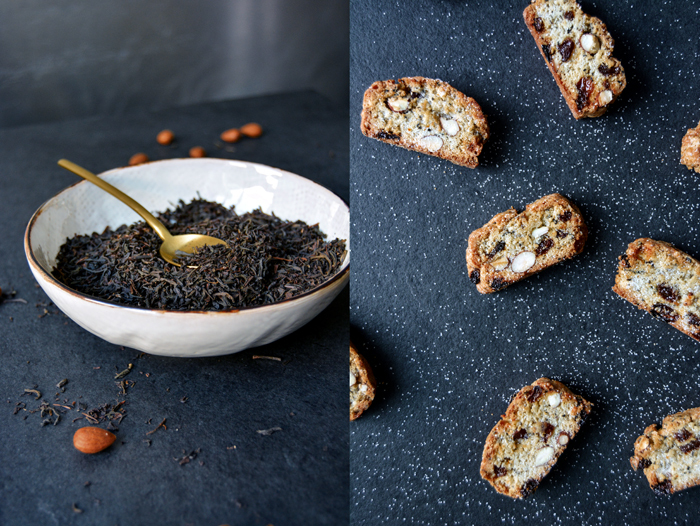 not being shy about your earl grey quantity and combining that flavor profile with raisins sounds gloriously yummy! 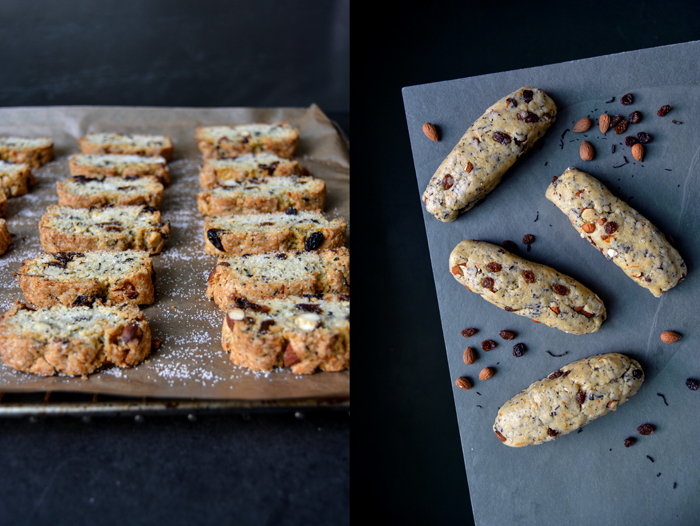 my latest cool biscotti experience was with sweet paul magazine’s fig and fennel biscotti. now, it is your version’s turn. i will be making this right after the banana amazingness. I didn’t use to buy many vinyls as a child, but a few years ago, my boyfriend gave me an old Braun vinyl player from the 1960s for my bday, I love it and since then I’m hooked on vinyl! 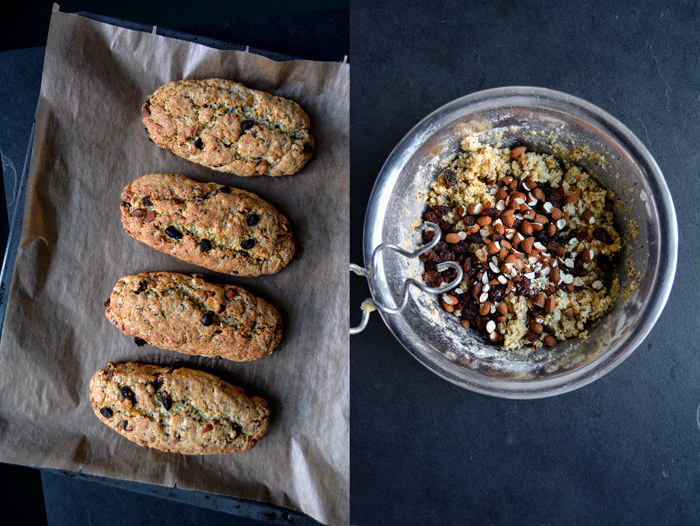 The sweet paul biscotti sound delish, I have to try this combination!